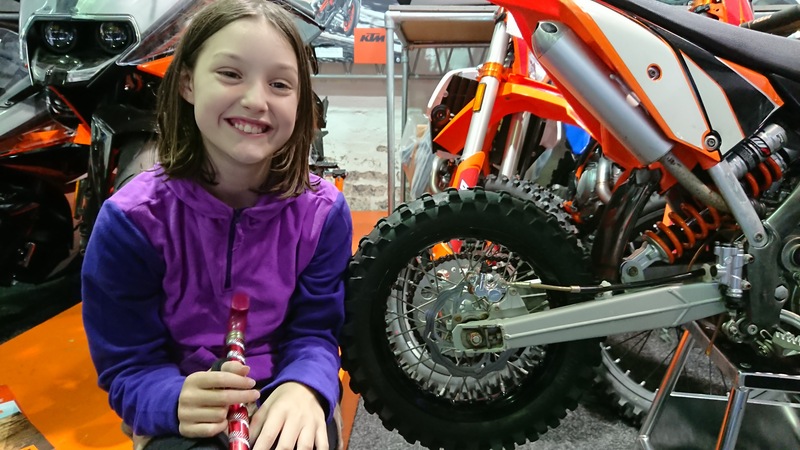 Over the weekend Ada and I went into Colwyn Bay KTM and Honda to look at quad bike wheels and see what inspiration could be drawn. 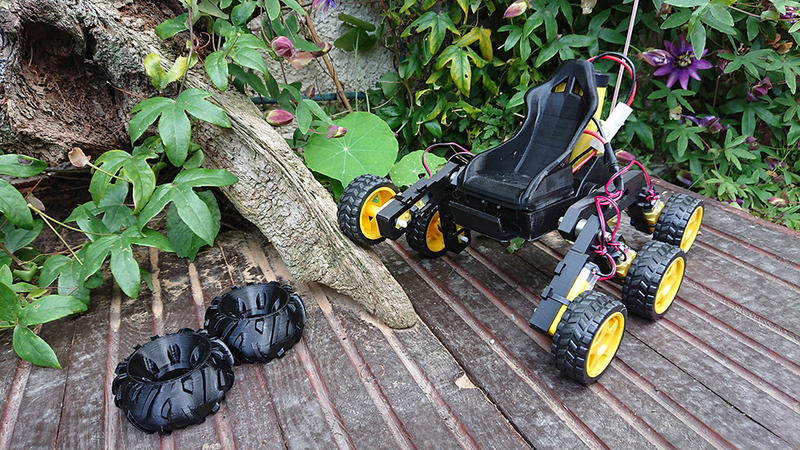 Originally I had in my mind that the wheelchair was going to use fat, chunky quad bike wheels to provide better grip on the wet rocks, however, for some time I’ve been thinking that a thinner 12″ wheel would probably do the job. Low-and-behold as we walked into KTM I was instantly drawn to this 12″ wheel on the back of a pit bike. It somehow seems smaller in the photos but I think it’s ideal. Without measuring the steps at the top of Snowdon and doing a lot more testing I won’t know for certain if 12″ is the right size but they do help to keep the overall weight down, will mean the wheelchair is more likely to fit through narrow gates and stair cases, and will look less menacing to mountain walkers. However, I am more drawn to the 13″ wheel which is capable of producing 225Nm torque, whereas the 12″ only 182Nm. Another useful feature of the 13″ wheel is that the wheel rim easily detaches from the hub. At £400 each (and I think we’ll need six), the motors are probably going to be the most expensive part of this build. If a rim gets damaged, it means that you can just replace the rim without having to replace the whole motor. It also means you can easily change the tyres so that you could have a set of both off-road and road going tyres. Combined, the wheel and tyre would have an outside diameter of 19″ and a width of 5″. This means that if the wheels were touching each other, the shortest possible length of a 6 wheeled vehicle is nearly 60″. This size needs to be increased though to allow the rocker bogie mechanism to work. I don’t yet know if a 19″ wheel will be suitable to get up the steps at the top of Snowdon but thinking about the overall size of the wheelchair, I certainly don’t want to go any bigger than this if possible. Generally speaking though, a rocker bogie mechanism is capable of overcoming obstacles which are twice the wheel height. For a 19″ wheel that’s 38″, or three and a half feet. Imagine seeing a wheelchair drive over a 3 1/2 foot tall obstacle!!! 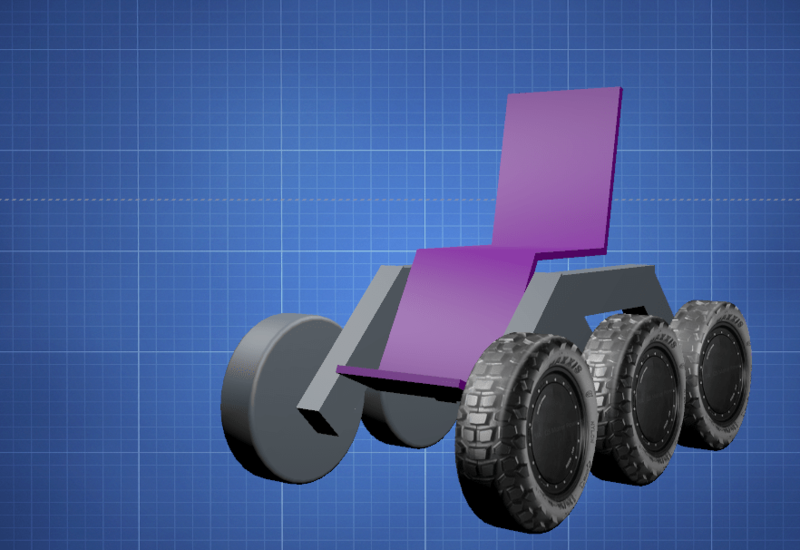 Taking the measurements of these wheels and combining them with the measurements of Ada’s current wheelchair, the following is a scale drawing of what the finished wheelchair might look like. Although this is a very rough concept and room needs to be made for the differential and batteries, and at the moment the positioning of Ada’s feet will dictate the maximum size of obstacle it can overcome, it does at least give some sense of scale and is a better representation than the current working prototype.